Just in time for the Christmas season, St. James Episcopal Church in Tigard welcomes our new priest. 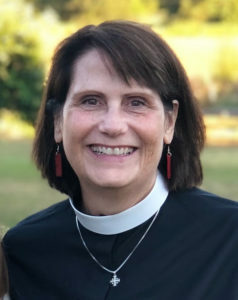 The Reverend Beth Kohlmeyer Mallon grew up in the Willamette Valley and is excited about entering into life with the entire Tigard area community. She was ordained a priest on June 23, 2018, after nearly 14 years as a vocational deacon, 11 of which were served at St. Francis of Assisi Episcopal Church in Wilsonville. Beth has a passion for preaching, a heart for those who are “out there” and not yet at the table, and for making sure that worship services are never dull. Long before ministry began, Beth graduated from Western Oregon University and taught sixth grade for two years in Monmouth. She and her husband, Kevin, then moved to Nebraska while they attended graduate school, where she picked up an MBA degree. The couple then moved to Northern California to be close to his parents. She worked as a personnel manager and they started their family. Beth and her husband, a psychologist for the VA, and their two children moved “home” to Oregon in 2007. Rev. Beth’s first Sunday at St. James will be this coming Sunday, Dec. 2, 2018 – the First Sunday of Advent! In addition to preaching and celebrating the Eucharist this coming Sunday, Rev. Beth will be holding an Open Forum during Coffee Hour where she will share some initial thoughts and respond to questions. Be sure to come out and meet Rev. Beth and her husband Kevin this coming Sunday! I am absolutely thrilled to be called as your priest-in-charge. And particularly to start my ministry here as we enter the season of Advent and approach the Feast of Christmas. Many thanks go to the Search Committee and the Vestry for their prayerful diligence that comes to fruition this Sunday! David Leathers has sent you a brief biography so you have a general outline of my life. I am happy to fill you in on more details as time goes on. For now, know that I grew up here in the Willamette Valley, was raised Roman Catholic, fell in love with the Episcopal Church in 1995, and served as a deacon in Northern California and here in Oregon for nearly 14 years before being ordained as a priest in June. My husband, Kevin, and I have been married for 38 years and we have two young adults in our family – Greg (26) and Claire (23). We are officially “empty nesters.” We live in Wilsonville, just a quick 20 minutes from St. James. Kevin and I have been involved in Cursillo for years (well, truthfully, mostly Kevin!) and he is also dedicated to Kairos Prison Ministry. I hear God calling the Church to ask, “Who isn’t here?” In other words, how can we invite people to join us in ways that allow those people to find a spiritual home at St. James? I believe that means going to where they are, listening to them, sharing what gives us hope, and offering joyful worship and real discipleship. I can’t wait to hear your ideas about this! I am excited to be joining you so that we, together, can see God do something amazing here. And so, the adventure begins!